Welcome to the Circus! 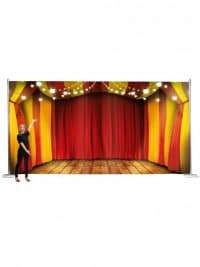 Our Circus themed props, supplies & decorations to hire will make you feel like you’ve entered a working Big Top, filled with Elephants, Lions and all the clowning around you can imagine. 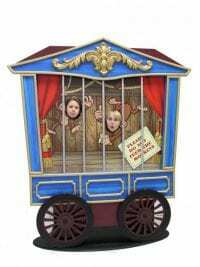 So roll up, roll up, c’mon inside and view our circus themed props to hire – you’ll have no end of circus theme party ideas when you do! Giant 3D Clown Head Circus prop to hire. 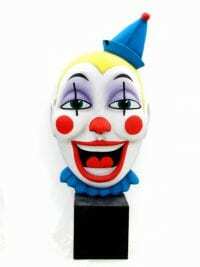 These colourful freestanding clown masks would be perfect for any circus themed events party or fairground party. Please note that we have varying facial designs & cannot guarantee which particular design you will receive on your order. The clown head comes with the plinth as pictured. Giant Juggling Clubs to hire! 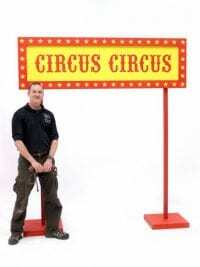 These giant juggling clubs would need a Giant to juggle them so best used to set the scene only at your Circus event! Lightweight, so easily moveable, these clubs have a brightly coloured finish and are presented attached together in a set of three (as pictured). 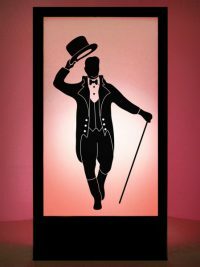 Ringmaster Silhouette Panel to hire. 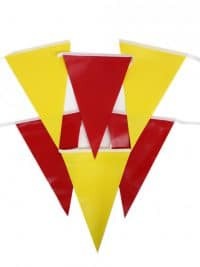 This silhouette panel is one in a series of Circus themed silhouette panels (below) and, along with some of our other Circus themed props, are perfect for any Circus themed party or event. 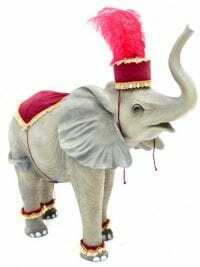 Circus Carriage Prop to hire. 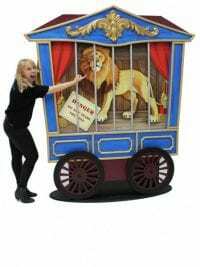 Our circus carriage will look fantastic at your circus, fairground or carnival themed events or parties. With a solid frame, metal-look bars and realistic graphics, the carriage will really help to set the circus scene! This is a 2D prop with some elements, such as the bars, brought off the surface to make it 2.5D and to bring an illusion of depth to the prop. The advantage of this is that the carriage will look very effective, without taking up too much of your valuable floor space! 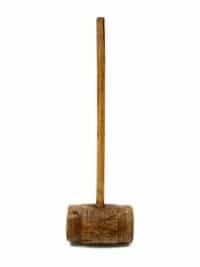 Please note that this prop is flat backed and so best used against a wall. Have lots of fun with these crazy mirrors. 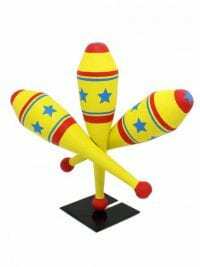 They are supplied as a set of 3 and are the perfect prop to hire for any circus or fairground themed event or party. 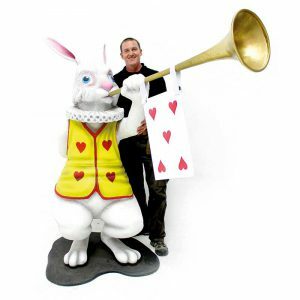 Check out some of our other circus and fairground props below. 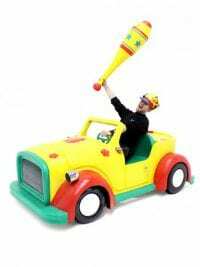 Circus Clown Car prop to hire. 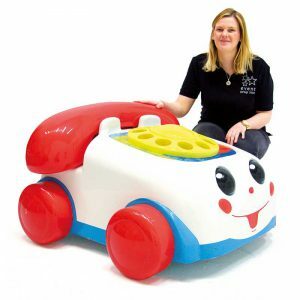 This fully 3d car would be perfect for any Circus themed event party, or even just for a children’s themed party. 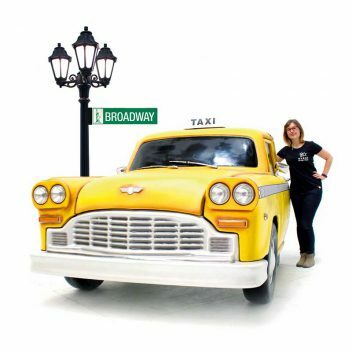 Car is mounted on castor wheels for easy transportation of prop and can even accomodate two people making it a great photo opportunity for your guests at your themed event! 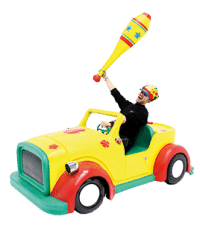 Our circus carriage will look fantastic at your circus, fairground or carnival themed events or parties and this one is a peep-through prop so you too can be a cheeky monkey by placing your head through the strategically placed holes! With a solid frame, metal-look bars and realistic graphics, the carriage will really help to set the circus scene! Wow! Look at this beast standing proud. 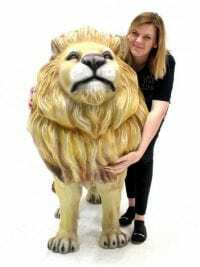 You can be sure our 3D freestanding Lion model will look majestic at the centre of your themed event! 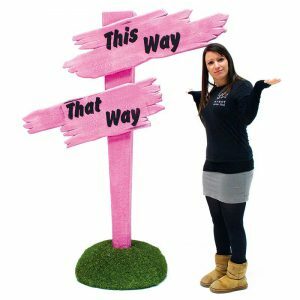 Take a look at all our other animal props available to hire within our animal themed prop section. Happy Clown Welcome Sign to hire. 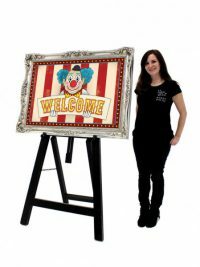 This sign is perfect to welcome your guests to your Circus themed event. The sign is also available with a gold frame and white easel, or with a different insert that simply says VIP Entrance (below). Or if you would like a scary option, we also have a Scary Clown welcome sign (below)! 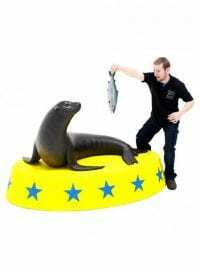 Our friendly sea lion is both life-size and freestanding and would be a welcome addition to any Seaside, Circus or Animal themed event! He even comes complete with the pictured plinth and the ball. Why not take a look at some of our other animals as well? 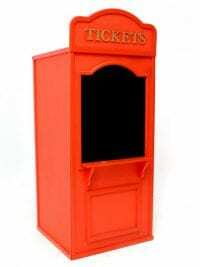 A great little filler prop for your Circus, Fairground or Carnival themed events or parties. 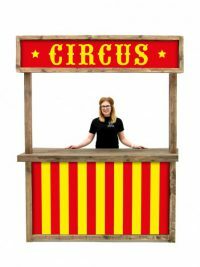 We have lots of fairground and circus themed props perfect for your next event; some ideas are below. 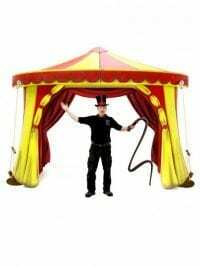 Alternatively take a look at our full Circus or Fairground themes. Fabric Straw Bale for hire. 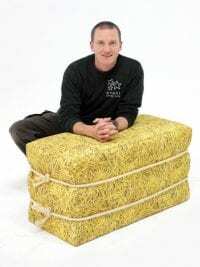 This is an ultra realistic looking fabric covered straw bale, which is suitable as seating or general decoration across so many different themes. So whether your event is Farm, Festival or Wild West themed, these straw bales will really help to dress the scene. Please note that the Cactus Prop and foliage pictured are available to hire separately (see below). 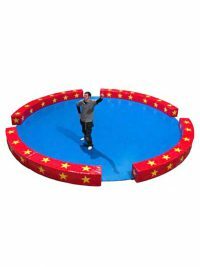 Circus Ring Dancefloor to hire. Perfect for any Circus or Fairground theme party, this themed dancefloor will provide a great dance area for your guests. The floor will arrive in panels that individually interlock together to form a solid and stable dancefloor. The red edging blocks Velcro into position and can be put in a position to form either 2 or 4 dancefloor exits. 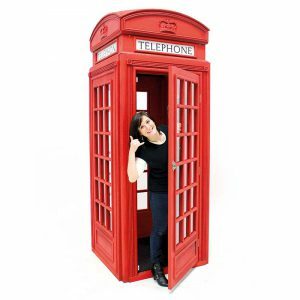 Please speak to our sales team if you would like us to install this item for you. 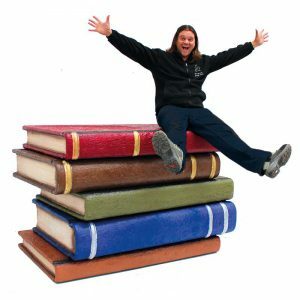 Giant Circus Prop to hire. Roll up, roll up! 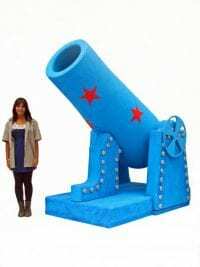 Check out our Giant Circus themed cannon! 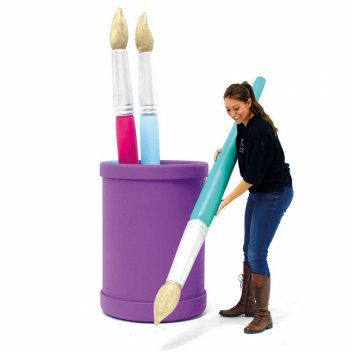 This brightly coloured prop would be the perfect addition to any Circus themed event. 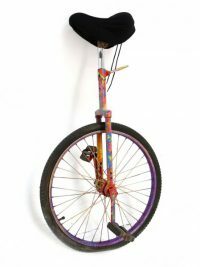 Why not have a look at the rest of our Circus themed props? Please note that it is not possible to place a person inside this canon. 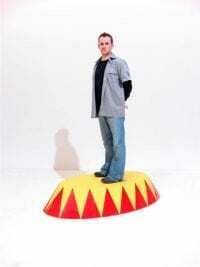 We recommend that this is used as a filler prop only and you do not attempt to ride this prop. Giant Juggling Ball Set to hire. 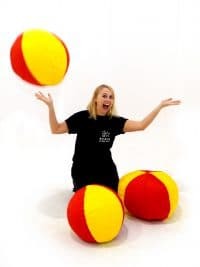 Hired as a set of three we recommend that unless you are a giant you use these juggling balls to help set the scene at your event rather than juggle! Colourful and fun they will look great at your circus themed event or party. Please note that these juggling balls are NOT seats and are for decorative use only. 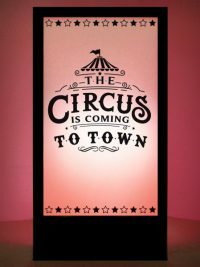 The Circus is Coming to Town Silhouette Panel to hire. 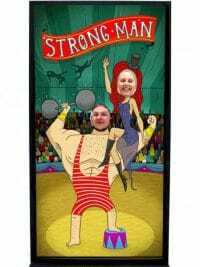 This silhouette panel is one in a series of Circus themed silhouette panels (below & opposite) and, along with some of our other Circus themed props, are perfect for any Circus themed party or event. Circus Sign Prop to hire. 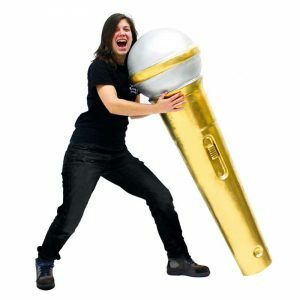 We also offer a customisable version of this product here. 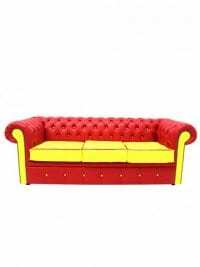 Red and Yellow Chesterfield 3-seater sofa to hire. 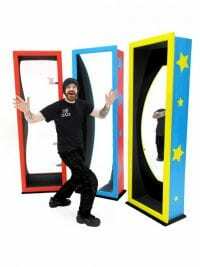 This is the perfect fun furniture to hire for any Circus or Superhero themed event or party night. Also available are a matching 2-seater (FUR282) and a single armchair in red and yellow (FUR281). 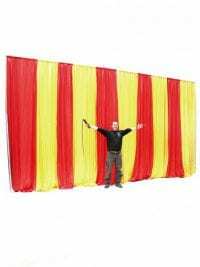 If you are intending to have a Circus or Fairground themed event then you will definitely need to consider this red and yellow striped fabric backdrop to bring your venue to life. This stunning backdrop instantly transforms a space by making a big bold statement. 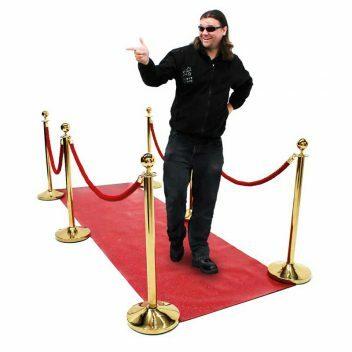 We supply the backdrop on legs that adjust in set heights ranging from approx 2440mm up to 4000mm so as long as you don't mind tucking the fabric under itself at the base you can easily use this item in most venues. Black Usherette Tray to hire. 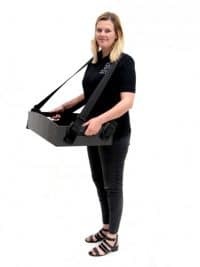 Perfect for any number of event themes, this usherette serving tray is comfortable, lightweight, has handles, adjustable straps and a crossover back strap to make the serving of items easy & efficient. 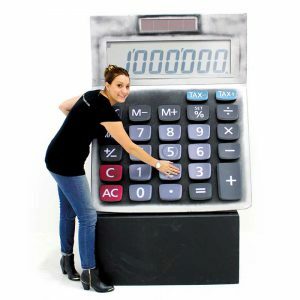 We also offer a customised version of this product with a custom printed front panel. Real theatre/cinema seating for hire. Each unit consists of two fixed chairs. 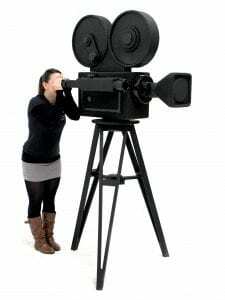 Recreate your very own theatre/cinema private viewing by ordering several as shown in the pictures. 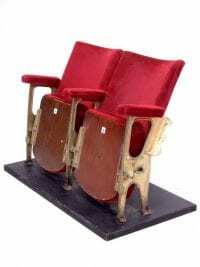 Please note that as this is authentic ex-theatre seating, it does therefore have an 'aged' appearance to it. Life-size Giraffe prop to hire. This Stunning life-size adult Giraffe is freestanding and suitable for any zoo, circus or Africa themed party event. Please take a look at all our other available animal props to hire within our animal themed prop section. Please note: This prop requires at least two strong individuals to manoeuvre. 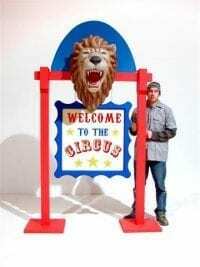 Circus Scenery Panels to hire. 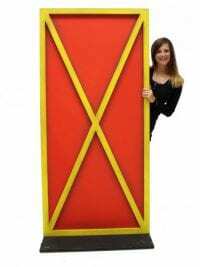 These red and yellow painted freestanding wall panels will really help to create the look and feel of a circus and will look fantastic with our Big Top Entranceway and other circus themed props. Take a look at some of our circus themed items below! 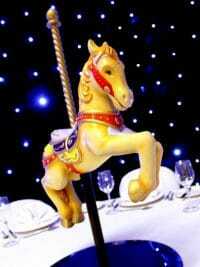 Carousel Horse Table Centre prop to hire. 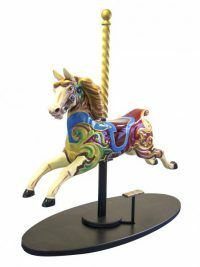 Perfect for any Circus or Fairground themed party or event, these beautiful carousel horse table centres are fully 3D and freestanding. Four different colourways are available; purple, green, yellow and blue (picture shows the purple version). Please note that Event Prop Hire cannot guarantee which colour you will receive and that the hire price is for one carousel horse table centre only. The mirrored disc is available to hire separately. 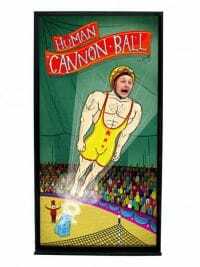 Circus Human Cannon Ball Peep Thru Board to hire. This peep thru board depicts someone shooting out from a cannon! 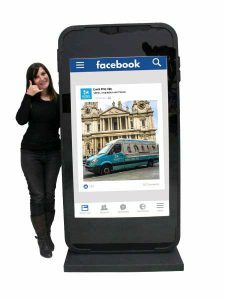 This prop is sure to provide a fantastic photo opportunity at your circus themed event or party.